Happy Friday everyone, I hope you had a great week and even better weekend ahead of you! 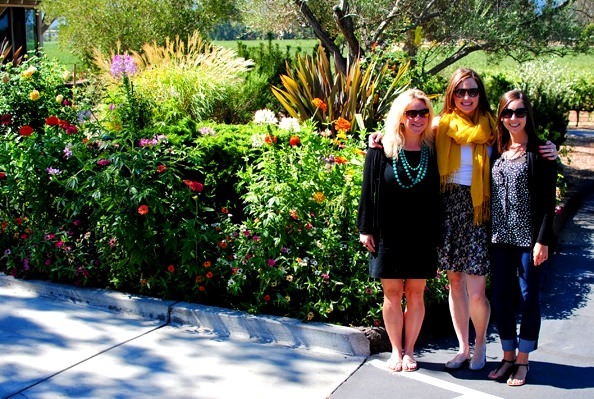 I’m heading to Seattle this weekend for a quick girlfriend getaway with my Napa ladies. My friend Lindsey recently moved to the area so Natalie (my fellow shortie) and I are heading out to help her explore and get to know the place. My heart’s already breaking thinking about leaving Lincoln for a few days, but I’m also very, very excited. Can’t wait to show you what we get into! I hope you’ve got something fun on the agenda too, and in the meantime please enjoy my favorite finds from around the web and beyond in this week’s Friday Favorites. Have a GREAT weekend! Favorite classic: The Best Carrot Cake. 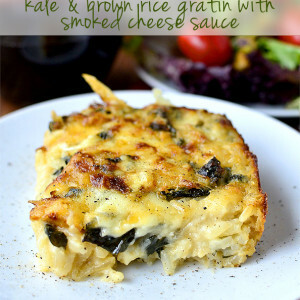 The minute I saw this recipe from Ali @ Gimme Some Oven, I tweeted her just one word: WOW! 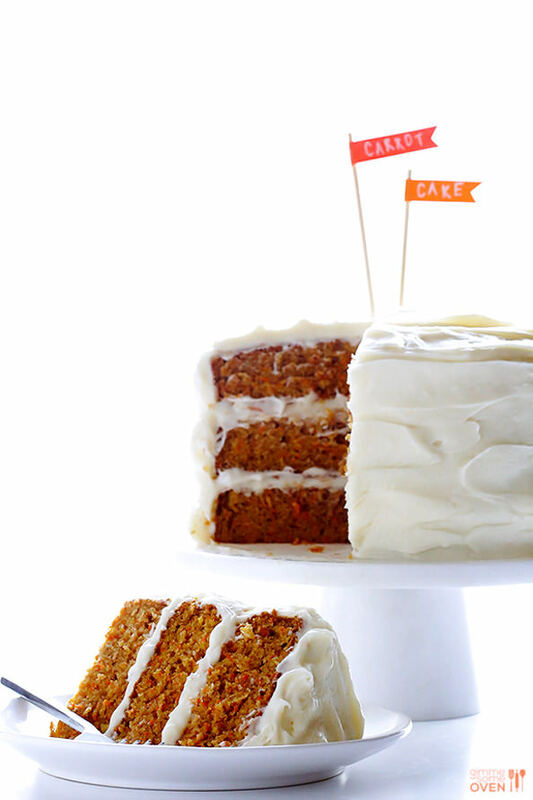 This may be the most perfect-looking carrot cake I’ve ever seen! Favorite find: BEpaperie. My cousin recently opened an Etsy shop featuring handmade paper goods including flowers like the ones she had at her wedding, stationary, and these HIGH-larious cards for every occasion. This girl is crazy-witty. I laughed like a maniac at every single one! Favorite photo: BLT Lettuce Wraps. 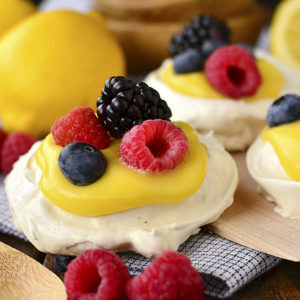 This photo and recipe is absolutely amazing. 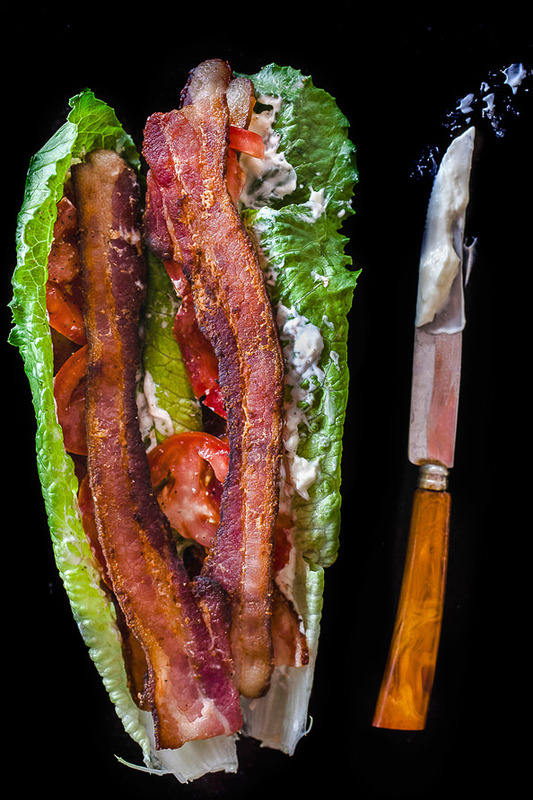 The pops of color against the black background and low-carb take on the classic BLT makes me want to dive right in. Favorite find: Omission Beer. 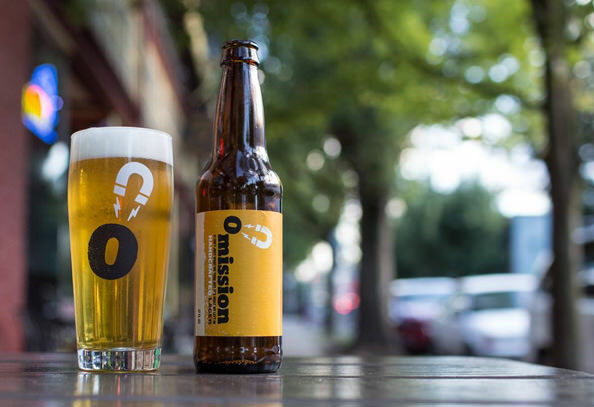 Thanks to the recommendation of several people on last Friday’s post I picked up a 6-pack of Omission gluten-free lager and was BLOWN AWAY. It tastes exactly like regular beer…because it is! This beer is brewed per usual then a special enzyme is added to take the gluten out. Don’t know how it works. Don’t care. It is perfection. Favorite bite: Flourless Peanut Butter Chocolate Chip Mini Blender Muffins. 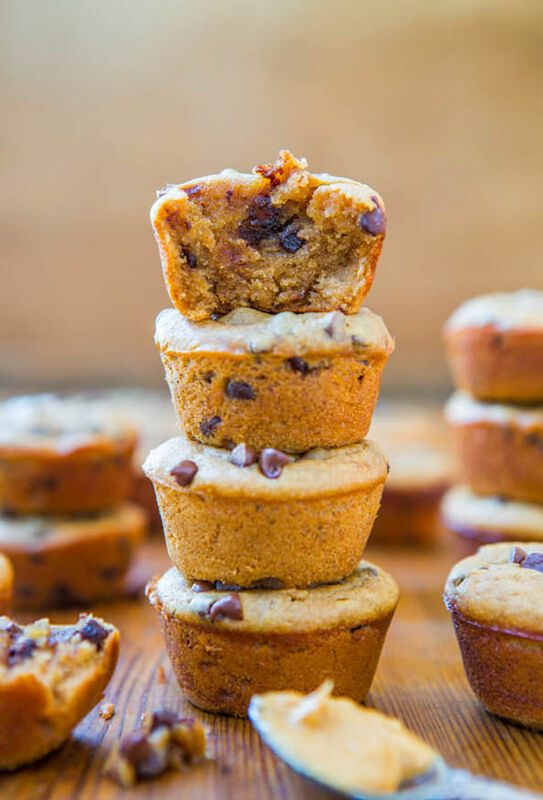 Mini peanut butter + chocolate chip muffins made in a blender? I am not mad at that! Favorite funny. Story of my life. No bag left behind! 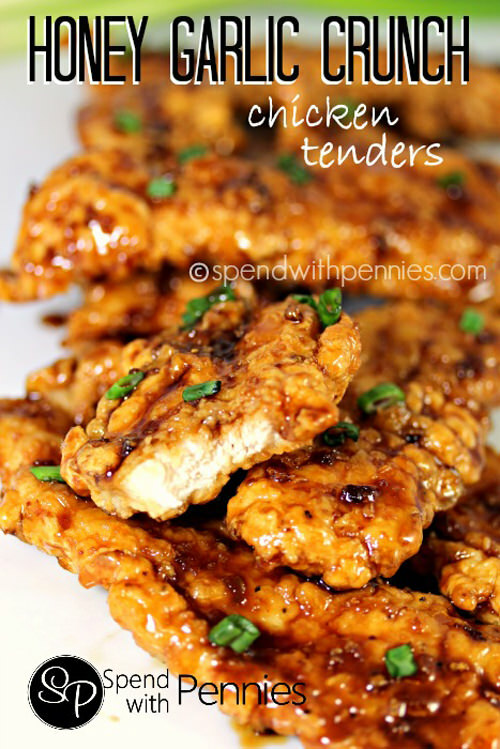 Favorite crunch: Honey Garlic Crunch Chicken Tenders. And I quote. “…crunchy, sweet, sticky and totally irresistible…” Ummm, yes. Favorite fun: Chalkboard Wall. Awesome project for the kiddos! 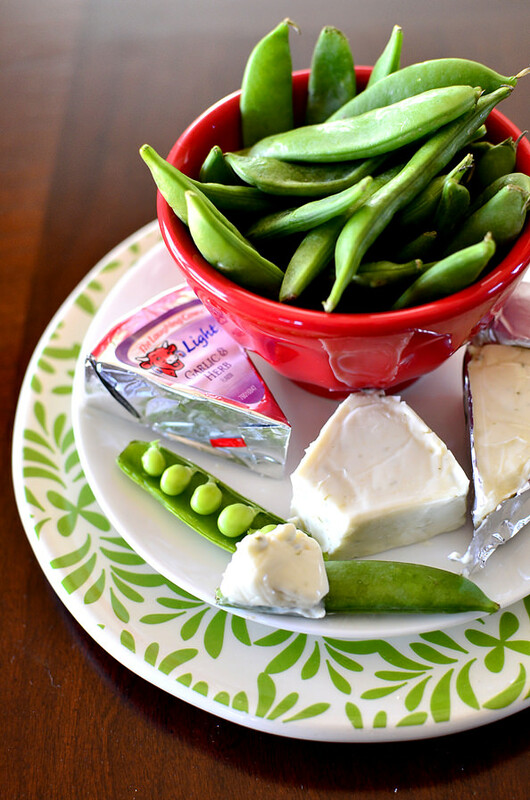 Favorite snack: Snap Peas + The Laughing Cow Light Garlic & Herb Cheese Wedges. I’ve been snacking on super-sweet sugar snap peas like it’s nobody’s biz lately. I tend to only eat them alone because I like to crunch them very loudly. Ahem. Anyway, they’re divine when dipped in The Laughing Cow Cheese Wedges, especially the Light Garlic & Herb flavor. 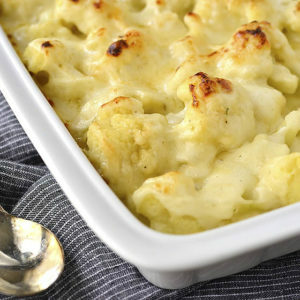 Love the combo of crisp and creamy! 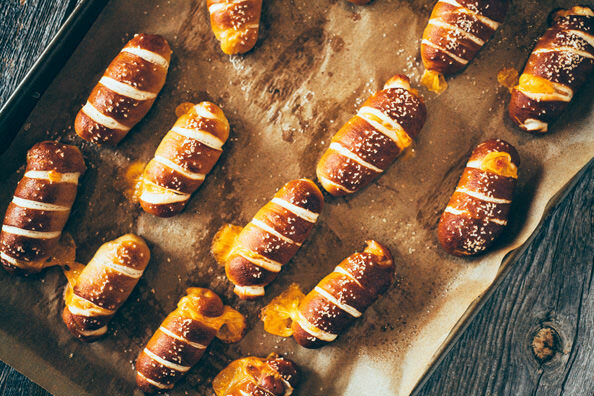 Favorite upgrade: Mini Pretzel Dogs. Like pigs in a blanket except way, way better. Bravo. Favorite truth. Workin’ on it! 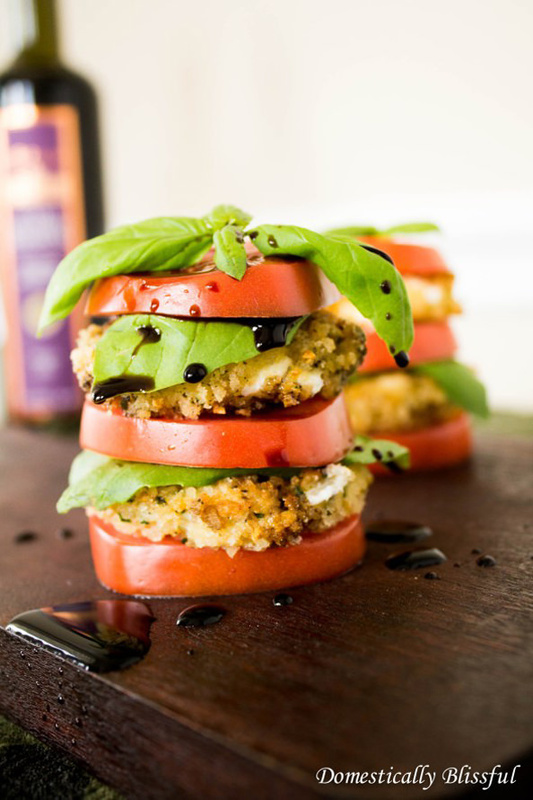 Favorite twist: Fried Mozzarella Stack. I thought I’d seen all the caprese combos that existed in the world but this fresh/fried/creamy/crunchy take is a new one for me. Totally mouthwatering. 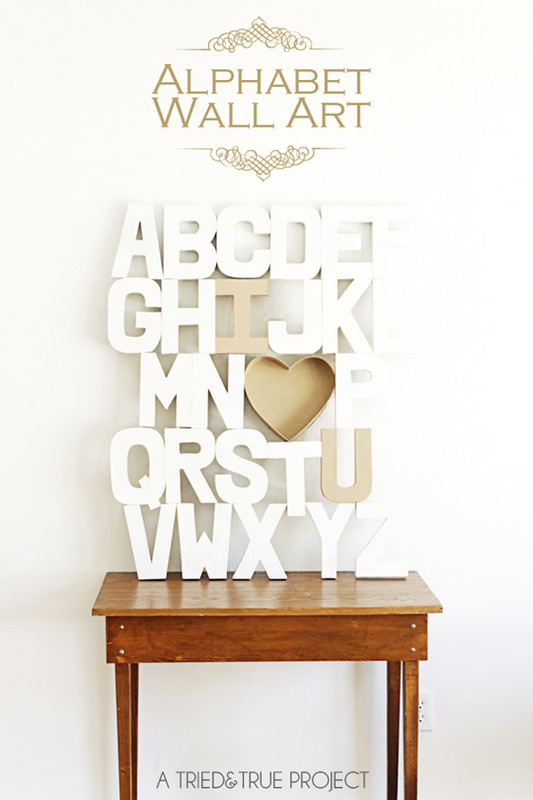 Favorite DIY: Alphabet Wall Art. This would be so adorable in a kids room, right? If you didn’t want to highlight I (heart) U, you could pick out your child’s initials instead. Either way – too cute! Favorite sweet treat: Chai Ginger Ice Cream Sandwiches. I. Can’t. Even. Dana @ Minimalist Baker wins at life! I am an official spokesperson for The Laughing Cow® in 2014. While I receive compensation for participation as a brand advocate, opinions are my own. Ugh, those peanut butter muffins are ridiculously good and take like 15 minutes start to finish. Weird thing…we freeze them for quick breakfasts, and they are soooooooo good slightly frozen. Amazingly delicious. 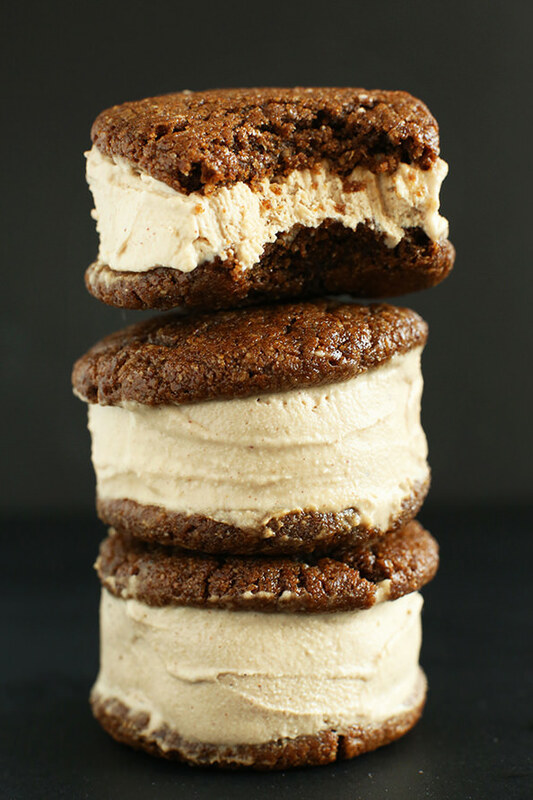 I need those Chai Ginger ice cream sandwiches in my life!! Two of my favorite flavors. Great list, as usual. Have fun on your trip! I just moved from Seattle! You must go to Portage Bay Cafe while there! It’s the best french toast I have ever eaten, they use fresh local ingredients, simply divine! They have 3 locations! Go to Rachel’s Ginger Beer and Beecher’s Handmade Cheese in Pike Place Market! I just came back from Seattle and went to both a few times. Ohhhhhh ~ so many wonderful places to dine in Seattle. If you can get yourself to The Whale Wins. http://www.thewhalewins.com/ Simply amazing food. Go to Ballard (the neighborhood) and wander the shops & restaurants. Cannot go wrong down there. Molly Moons for ice cream. Pikes Place Market – of course! The Beechers mac & cheese is to die for but not at all gluten free. Their cheese is fabulous. Skip Starbucks in favor of some smaller, local places. Too many to even begin listing. Portage Bay Cafe is amazing and they have a nice selection of gluten free meals too. If you’re looking to try more gluten free beer check out Lakefront Brewery’s New Grist. It’s brewed in Milwaukee, WI and is available in almost every state in the US. Have a wonderful weekend in Seattle! Two of my good friends live there and I love visiting them. The Thai food is sooo good! I always like stopping in the International District for food and bubble tea. All those independent coffee shops with scratch made food, and my friend’s family took us to Revel for brunch. We also visited the Theo chocolate factory. You can take tours, but we just visited the store and bought more than we expected. Thanks for sharing your favorites. Chai-ginger ice cream? Shut. Up. Seattle is a great city, we might even be able to show you some sunshine! I second the nomination of Purple Cafe (they have one in Woodinville which has great wineries surrounding it too)! their lobster mac and cheese is to DIE for! Totally agree with you on the cupcakes! Trophy is pretty but Cupcake Royale tastes WAY better. And yay on our sunshine!!! The Pink Door! It’s an Italian place in Diagon Alley across from Pike’s market. It is sooo good! Pink Door is fun and tasty, but it is in POST Alley. Thanks for including my Fried Mozzarella Stack! Ha! Adorable Harry Potter nerd alert. The pink door is in Post Alley. Definitely enjoy Seattle’s diverse food options, best Thai, Sushi and Korean! The Great Wheel is worth a ride on nice day. And getting a coffee and walking on a ferry is a good way to pass a few hours and see things from a different perspective. that chalkboard wall is my favorite. i love it and think i need one in my apartment. Ah I’m so jealous! I grew up in Seattle and miss it so much! Try to make it out to Bainbridge Island if you can! And ride the Great Wheel! What Shannon said…..there are some great things happening in Seattle these days. Airfield Winery in Woodinville. Love their Tempernillo. And you have to get your baby a Seahawks Superbowl Champ t-hirt! That BLT does look so fresh and yummy! Thanks for the laughing cow pairing recommendation, I love snacking on their wedges! Here are some places that we liked, in Seattle. Have fun. LOVE these posts Kristin! Your cousin’s cards are hilarious. Family will be enjoying them for birthdays, etc. this coming year. The flourless PB muffins are amazing and quick. A favorite weekend treat in our house. Just texted my husband about the GF beer and he immediately replied back – Yepthatsmyfav! 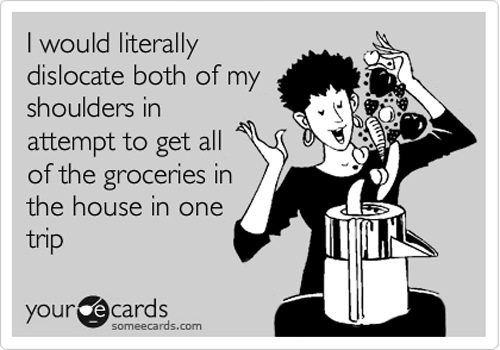 And you better believe I attempt to carry every grocery bag into the house on the first trip. Glad to know I’m not the only one. Thanks for the share friend! I love you. Of course Pike Place Market – with Beecher’s right across the street. Molly Moon’s Ice Cream AND Full Tilt Ice Cream. Yumm! Ray’s Boathouse – eat in the ‘cafe’ upstairs for pretty much the same menu. The food is good and the view is amazing. It looks like I might be in the minority, but I’m not a huge fan of Purple Cafe & Wine Bar. I’ve been there a few times and it’s always just been meh. Ha, I just used “meh” to describe Purple before I read your post. I totally agree with all your suggestions. I’m trying Delancey for the first time this weekend, can’t wait! Can I have one of each? Please? Loving the grocery bag quote. So true. So many great options for you to try! *Also The Gerald & Hot Cakes if you are in Ballard. The Gerald has the best cocktails and a sweet mad men vibe. * I agree on the Trophy/Cupcake Royale Debate. Cupcake Royale wins and they now have icecream. Have fun while you are in town. I love your blog and am excited for all the new gluten free recipes in the future. I am a Seattle-ite! Check out Din Tai Fung in either Seattle near UW or across the lake in Bellevue! World famous and there are very very few in the US at all. Get the soup pork dumplings for sure and enjoy the pop of flavor in your mouth! Ah shoot, I forgot the new celiac diagnosis. Din Tai Fung won’t be a good option as everything has gluten mostly. Sorry. I love that you have A Friday Favorite Beer! And I just moved to Seattle two weeks ago from LA. It’s been really amazing so far, and the sun is even out today. I’ve always wanted to visit Seattle, but haven’t made it there yet. Looking forward to hearing about your trip! We are taking a family vacation to seattle this summer so this info is super helpful! Cannot wait to see all you do and love reading these recommendations. Any tips for a 9 year old celebrating her birthday in Seattle? Looks like I know where to get cupcakes! @Jenny – If its going to be summer then I suggest celebrating at a lovely park in seattle. Carkeek Park in the seattle broadview neighborhood is perfect. Carkeek has lovely views of the sound and a fun playground with a big open field to run around like crazy. Plus you can take short walk over a bridge to the beach to play in the surf or find shells. I love Seattle. Some must do’s- a Cuban sandwich at Paseo’s and dinner at Cascina Spinasse (do the chef’s tasting menu. Also stop in World Spice Market just outside of Pike Place Market and stock up on spices. You have thee best taste. I always love your Friday Favorites! It’s supposed to be chilly but gorgeous this weekend in Seattle, good timing! I totally agree with the Portage Bay Cafe recommendation – delicious brunch and they have lots of GF options. Apparently I’m the only one who has had a bad experience at Purple, but I thought it was pretty meh. I would recommend Pink Door and Tavolata for Italian food, Poppy and Joule for Asian, Rock Creek for seafood, and the Ballard Farmers Market on Sunday for people watching. So many amazing options, have fun! Love Seattle, had a girls weekend there myself a few years back. Loved the ferry ride and wineries on Bainbridge Island. Loved staying downtown, taking in the cafés and local flare around the market. You can’t miss Hot Cakes in Ballard. Absolutely DEVINE. I live in Seattle and it is supposed to be sunny all weekend! All great suggestions listed! If your going to brunch I would highly suggest Cafe Campagne in Pike Place Market! Also any Ethan Stowell restaurant is worth a visit, i believe he has 5 or 6 in the Seattle area, Tavolota being right in downtown seattle. Can’t wait to read your review and see what you and your friends did in Seattle. 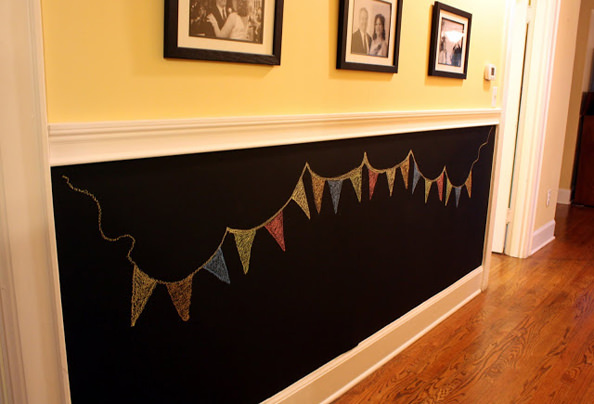 Not sure if anyone’s mentioned it but a great idea to go along with the chalkboard wall is magnetic paint. Paint a coat of it underneath the chalkboard paint & you get double the fun! that fried mozz salad idea is outta control, i need that in my life! I have only visited Seattle once, but some locals recommended that we take the underground tour. It is definitely a unique experience! Yard House downtown on 4th has the best Chicken Tortilla soup ever!!! 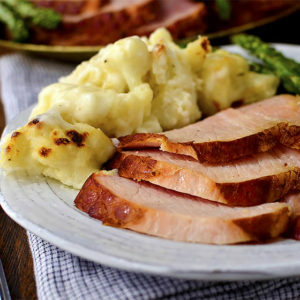 It’s creamy and has big chunks of roasted chicken. I get it every time I’m in Seattle. And have the creamy butterscotch pudding dessert. It will make your tummy smile!!! I LOVE every single thing about this post. Right after I hit “post” I will be finding out how to make some of them mine! Thank you! 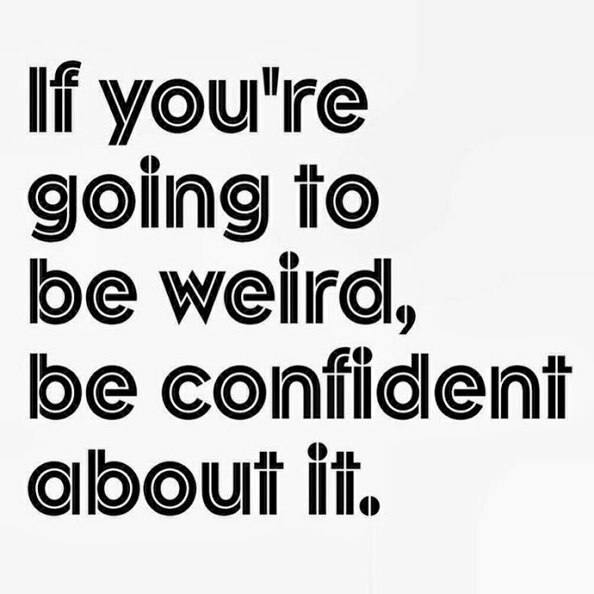 And hope you have an amazing weekend!! Being Celiac for four years, I had my first cinnamon roll at Coffee and Specialty Bakery in October. They are located one street over from Pike Place Market. The ENTIRE bakery is GLUTEN FREE! It’s a small bakery, but the cinnamon rolls are heavenly! Here’s a link to their website http://www.coffeeandpikeplace.com. Enjoy your trip! in seattle come to Le Panier (a french bakery in Pike Place market) and get a gf macaron! If you like Greek food then check out the Byzantian in Capital Hill. Was just there for dinner myself today actually. The pretty pink and white cherry blossoms are in bloom at UW I heard! Gas Works park is nice. Check out Freemont and Wallingford for art and shopping! * Yes to Portage Bay- there’s a topping bar that’s great on their oatmeal. * I’d recommend Cafe Flora over Purple for more interesting dinner. Have a great weekend. 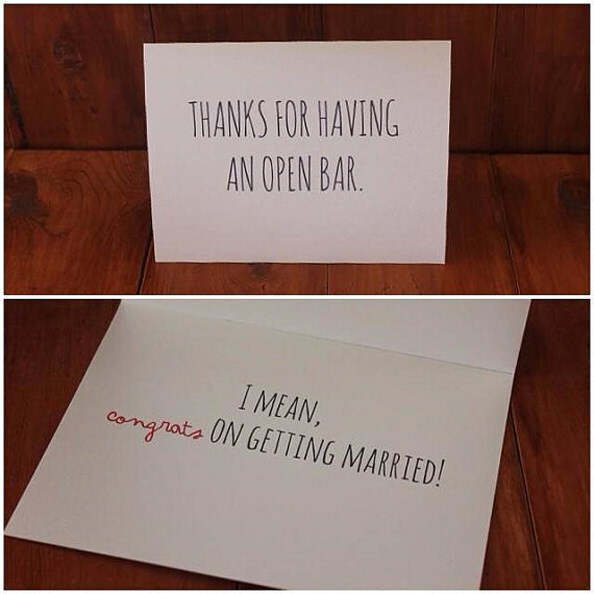 Love those wedding cards!!! Too cute. 1) PASEO – hands down, the best sandwich I’ve had in my life – I lie awake at night thinking of this place! 2) DAHLIA BAKERY – tiny tiny place with amazing breakfast sandwiches, giant fig newtons, and tons of other goodies. Tacos Guyamos at Greenlake!! Best margarita ever! !